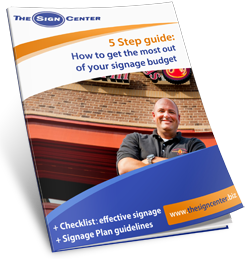 5 Step Guide: How to get the most out of your signage budget? Most signage in facilities is handled on an as-needed basis. A sign is bumped and scratched, creating the need for a replacement. The material and design chosen for the replacement sign is often guided by nothing more than whim. It’s our goal to help you get the most out of your signage budget. Fill out the quick form and download your free copy now!